Downtown New Bern Bridge to Open Tomorrow! 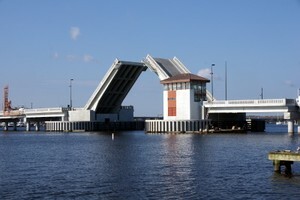 LocationHomeGeneralDowntown New Bern Bridge to Open Tomorrow! The almost three year, $40 million dollar construction project is finally complete! The Alfred Cunningham Bridge, a direct link to Downtown New Bern, is slated to open to traffic Friday afternoon. The bridge has been impassible since 2007 as crews worked to replace the 1950s swing bridge. This has been a much anticipated opening for downtown travelers, boaters and especially the local merchants. Though a bit delayed, the bridge opening is still good timing for all of the upcoming New Bern 300 festivities. With so much going on, 2010 is a great year to visit this vibrant and historical town…..we look forward to seeing you in our neck of the woods for the celebration!